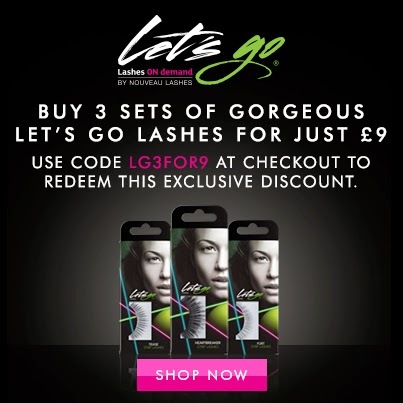 These are the incredible Let's Go Lashes from Nouveau Beauty Group. I must say I hadn't heard of these lashes up until now, and I can actually say that these are one of the best lashes I have ever tried. I was given the Temptress 3 style, which is a a lengthening and volumising without being too over the top. With very small eyes, I regularly wear lashes, as because of my hooded lids, my lashes always get pushed down, making my lashes look smaller. Once opened they look like this. They also come with a small tube of adhesive which is great, as I always loose my eyelash glue! If I was going to be picky, for first time users it might be nice to have 'L' and 'R' on the case, just so people don't get confused. I know for experienced users this isn't a problem, but for young girls who are experimenting, that would be great. As you can see, the lashes are very full and adds a great look to the lashes without being too much at all. These are so easy to apply too. Just remove them from the packaging with tweezers, apply glue and let it dry for about 30 seconds until tacky. Then using the tweezers again, line it up and apply it to your lash line and push with your fingers to keep them in place. That's it!! These are so easy to apply, and feel incredibly lightweight - I didn't even know they were there! I will for sure be buying some more packets, and these are really my new favourites. I am in love with these! For a price of £6.50 for some really impressive quality lashes, you can't say no. Grab these for £6.50* from Nouveau Beauty Group. Check below for a discount for my readers! They look amazing lashes, they create a statement yet still look reasonably natural and classy. Love them!